I also have an Olivia at 4 stars (level 1), Cecelia at 3, FRobin at 3 that didn't fit into the picture. Also any advice on what 4 stars to rank up first to 5? I have almost enough feathers now. so I'd say Nino up to 5* for you. 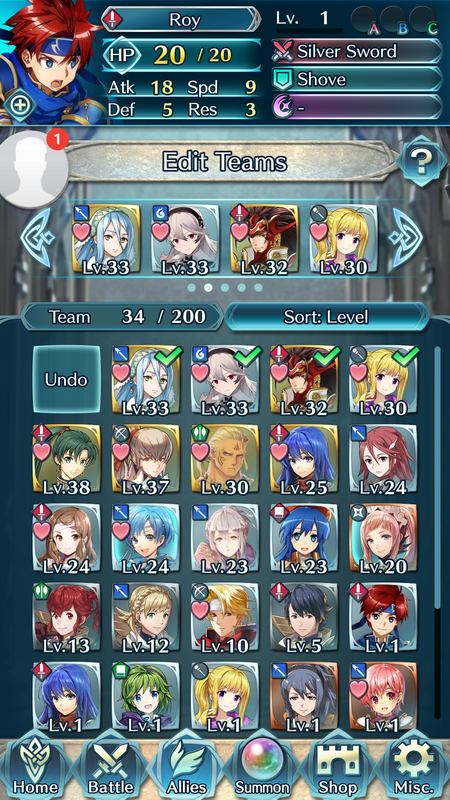 As for your current team, kick Clarine for Takumi. Eventually, Nino will replace Corrin. So for a final, Azura, Nino, Takumi, and Ryoma would be best? Any other combinations by any chance for fun? :) Lyn is a bit squishy and Hawkeye isn't the greatest either. Any reason to train Olivia, Corrin, Lilina, Effie, Cordelia, Jeorge, etc in case the meta changes and I'd have some backup units? Yep, three Fates characters with a Nino works as a team! However, teams aren't set, and this game is ripe for experimentation. If you want to level someone, go for it - no one is so horribly awful that it will be a waste of time! My arena team is only half of the meta, with the other half being a giant head-scratcher, yet they worked well enough together. I wish there was a friendly battle or something where you could test team comps without wasting an arena battle. It would make things a lot easier and I'm sure teams would have much more diversity than Takumi + Olivia = win.